The Formentera Council's land and tourism councillor Alejandra Ferrer appeared in the Sala de Cultura today at 11.00am to lead an info session on the system for regulating the rental of vacation accommodation. 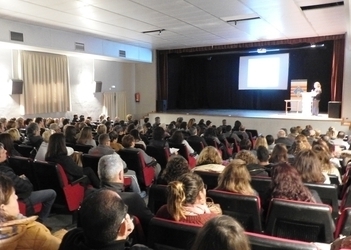 Ferrer was joined by David Francés from the administration's legal department in outlining recent changes in Formentera's tourism by-laws for a crowd of roughly 250. Ferrer spoke about modifications in the island's land directive that affect zoning and a cap on occupancy for holiday rentals. She also went over other changes—to the so-called “Plan for Quality in Vacation Rentals”, the by-law regulating the per-bed cost of permits to rent accommodation, the tax by-law underpinning a levy for administrative services in tourism, and Regulation 1/2015 on vacation rentals.